Cartwright Fleet Services (CFS) has supplied Hermes with 244 specialist home delivery box vans and 70 tractors on contract hire, having leveraged the strengths of its parent company, the Cartwright Group, to beat off stiff competition for the contract. The “one stop shop” deal supports the ambitions of CFS to become one of the leading fleet management and contract hire businesses in the UK and comes with ongoing maintenance for five years. Finance was arranged by Cartwright Finance. The contract win underlines the strength of award-winning Cartwright Group’s offering which includes trailer, commercial vehicle rigid body, manufacturing, specialist vehicle conversion. The Cartwright Group offers a complete total cost of operation solution from manufacturing to exact specification, service maintenance, asset financing, trailer rental and fleet management across a network of sites in the UK. As well as the 244 specialist parcel vehicles the agreement represents one of the largest orders in the UK for natural gas-powered vehicles with 30 of the Iveco tractors fuelled by Compressed Natural Gas. The remaining 40 tractor units will be diesel. To keep downtime to a minimum, the new fleet is also maintained by CFS through its nationwide network of service centres, giving Hermes a seamless and comprehensive fleet solution. This order demonstrates CFS’s commitment to providing a total fleet managed solution for its customers and represents one of many orders and developments in the pipeline. Lawrence Todd, Director of CFS, commented: “We are delighted to have won this contract to supply Hermes with a complete package from design and build through to finance and ongoing fleet management. “It is a testament to the strength of the Cartwright Group offering that we can supply customers a comprehensive fleet solution that gives them complete peace of mind: we take care of their transport needs. 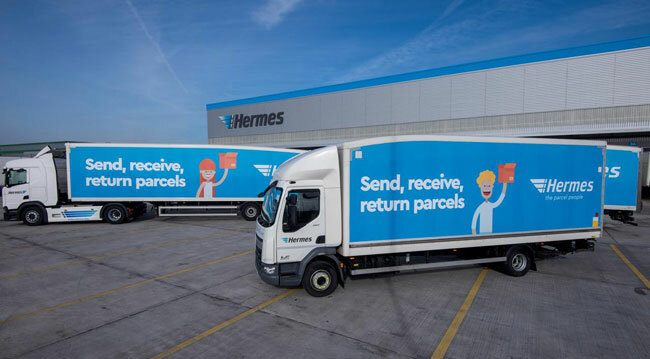 Parcel carrier Hermes has been actively improving the sustainability of its fleet since 1992, being an early adopter of alternative fuels and it now runs electric and natural gas in the UK and Europe. The contract win reflects the remarkable growth of CFS which in recent years has expanded operations to look after more than 12,000 assets through its network of national owned main dealers and workshops, mobile technicians and a service partner network. CFS, based in Altrincham alongside the Cartwright Group’s HQ, has a turnover of over £50 million and now employs 320 people. Its success has contributed to the overall growth of the Cartwright Group which has for the second-year running been named in the Sunday Times Top Track 250 of the UK’s fastest growing private mid-market companies.